TEHRAN (AFP) - The mysterious "mass suicide" of 152 dolphins washed up on Iran's coast over the past month has alarmed environmentalists, with the blame pointed at regional fishing practices, officials said on Monday. In September, 79 striped dolphins were found washed up near Jask port in southern Iran, and last week another 73 were found dead in the same area. Pictures of rows of the corpses have been widely featured in Iranian newspapers, which said the dolphins had "committed suicide" -- behaviour the animals have occasionally exhibited in the wild. "The suicide of dolphins on Jask's coast continues," Iran's state run-newspaper wrote on Saturday. "Locals tried to put the animals back in the water but they refused to return." Concern over the deaths of these highly intelligent mammals prompted Iran's environmental protection authorities to show reporters the cut and bruised corpse of a dolphin to explain the "suicides". Mohammad Baqer Nabavi, deputy head of Iran's environmental protection organisation in charge of marine biology, said the most likely explanation was that the dolphins drowned after becoming entangled in fishing nets. "We are basing our hypothesis for the suicide on fishing -- either nets left at the bottom of the Persian Gulf or the big fishing nets that ships spread to catch different kinds of fish," Nabavi said. "As you know, they are marine animals but they need to come up to surface and breathe." It was unlikely that the deaths were caused by pollution, with no traces found in the tissue of the dolphins examined a month ago, he said. "We did not spot any kind of pollution in their digestive system that could have been caused from eating poisoned fish, and we also have not spotted any viruses or parasites," he said. Striped dolphins are normally found in temperate and tropical waters. TEHRAN, Oct. 4 (UPI) -- A recent wave of whale and dolphin deaths off the coast of Iran is being blamed on high pollution levels and a July oil spill. Experts said the deaths, which were reported after 79 dolphins washed ashore Sept. 25, are related to a July 15 spill at Iran's port of Bandar Abbas that released oil sludge containing several byproducts into the Persian Gulf, Radio Free Europe reported Thursday. Ebrahim Kahrom, an Iranian environmentalist, said the gulf is 47 times more polluted than what he considers to be the "standard level." He told RFE "severe oil pollution" related to the spill and other oil slicks present in the water may have killed the dolphins and six whales that have washed up over the course of the past month. Kahrom said the confluence of the Persian Gulf and Oman Sea is "the most polluted area of the southern seas." However, Mohammad Baqer Nabavi, a deputy head of the Iranian Environmental Protection Organization, said to RFE that he was skeptical that the deaths were the result of the spill. He said the dolphins likely died from gradual poisoning related to "chemical pollution" or oil. TEHRAN: The mysterious �mass suicide� of 152 dolphins washed up on Iran�s coast over the past month has alarmed environmentalists, with the blame pointed at regional fishing practices, officials said yesterday. At the end of September, 79 Striped Dolphins were found washed up off the southern port of Jask in southern Iran, and last week another 73 dolphins were found dead in the same area. Pictures of rows of dolphin corpses in the sand have been widely featured in Iranian newspapers, which said the dolphins had �committed suicide� � behaviour the animals have exhibited on occasion in the wild. Mohamed Baqer Nabavi, deputy head of Iran�s environmental protection organisation in charge of marine biology, said the most likely explanation was that the dolphins drowned after becoming entangled in fishing nets rather than because of pollution. 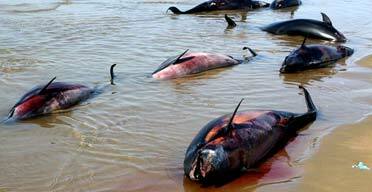 �We did not spot pollution in the tissue of the dead dolphins a month ago,� he told reporters. �We are basing our hypothesis for the suicide on fishing - either nets left at the bottom of the Gulf or the big fishing nets that ships spread to catch different kinds of fish,� Nabavi added. A Striped Dolphin, normally found in temperate and tropical waters of the world�s oceans, was frozen and shipped in from southern Iran for display and showed traces of bruising and cuts. �We did not spot any kind of pollution in their digestive system that could have been caused from eating poisoned fish, and we also have not spotted any viruses or parasites,� he added. But he also emphasised that the mystery had still not been solved. He said that a committee comprised of the oil ministry, Tehran University, veterinary and shipping organisations and even the Iranian naval forces had been set up to find the cause of the problem. Nabavi said that in the next two weeks there would be some preliminary results about the cause of the dolphins� deaths. US nuclear-powered naval ships and other sophisticated marine craft have also been operating in the Gulf, using ultrasound tracking devices that sometimes hinder the eco-locations intrinsic in sea mammals such as dolphins. مديركل حفاظت محيط زيست هرمزگان به دنبال پيدا شدن لاشه ‪ ۷۹قطعه دلفين در سواحل شهرستان جاسك، آلودگي دريا به موادنفتي وگيرافتادن درتور كشتي‌هاي صنعتي را مهمترين احتمالات مرگ گسترده و دسته جمعي اين پستان داران دريايي اعلام كرد. افزايش فعاليت‌اكتشاف، بهره‌برداري، انتقال و پالايش نفت به همراه آلودگيهاي صنعتي ناشي ازفعاليتهاي صنعتي اعم از نيروگاهها و آبشيرينكنها، بندرگاهها واسكله‌هاي متعدد به‌همراه لايروبي و لايريزي‌هاي مكرر را ازجمله منابع آلاينده آبهاي خليج فارس ذكر كرد. وي همچنين ازتخليه فاضلاب و زباله شناورها و سكونت‌گاههاي شهري و روستايي و پسماندهاي كشاورزي به‌همراه افزايش دماي اقيانوسهاناشي ازگرم شدن تدريجي كره‌زمين به‌عنوان ديگرعواملي نام‌برد كه‌به‌همراه‌آلاينده‌ها موجب تغيير شاخصهاي "فيزيكي‌وشيميايي" آب شده و با به‌خطر افتادن سلامت وكيفيت محيط زيست دريايي مي‌تواند تلفات موجودات آبزي را به همراه داشته باشد. وي ادامه‌داد: علاوه براحتمالات يادشده و باتوجه به‌اين‌كه آبهاي دور ازساحل شرق شهرستان جاسك معبر تون ماهيان به شمار مي‌رود در نتيجه هنگام صيد تون ماهيان به روش صيد محاصره‌اي يا پرساين(كه مورد استفاده كشتي‌هاي صيد صنعتي است) دلفين‌ها نيز به دام مي‌افتند كه آثار فرو رفتگي ناشي از جسمي نوك تيز در ناحيه باله پشتي ‪ ۲تا ‪ ۳قطعه از دلفينها مشاهده شده است. مديركل حفاظت محيط زيست هرمزگان تاكيد كرد: اين امر به كرات و به صورت چندين قطعه در هر سري در گذشته نيز اتفاق افتاده است. وي يادآورشد:اعلام‌نظرقطعي درخصوص علت مرگ دلفينها نيازمندبررسي نمونه‌هاي گرفته‌شده وكسب اطلاعات كاملتر ازمراجعي نظيرسازمان مركزي حفاظت محيط زيست، دانشگاه علوم پزشكي، دامپزشكي، شيلات و ديگر مراجع ذيريط است. اين درحالي است كه به گفته برخي كارشناسان بدليل وجود فاصله طولاني زمان مرگ دلفينها و نمونه برداريهاي انجام شده بعيد است كه نتيجه روشن و قابل استنادي از اين گونه نمونه گيريها بدست آيد. هرچند سازمان حفاظت محيط زيست به بحث تاثيرآلودگيها اشاره كرده، اماچون به منشاء آلودگيهاي احتمالي ومنابع آلاينده درمنطقه موردبحث، اشاره‌اي نشده است ارزش اين اطلاع رساني در حد يك مقاله علمي تقليل يافته، چرا كه سازمان محيط زيست دراين بخش تنها به تاثير كلي آلودگيها درمرگ ومير آبزيان اشاره كرده كه اين مسئله مي‌تواند درهرجاي دنيا مصداق داشته باشد. اما درميان ساير سازمانهاي مرتبط، به نظرمي‌رسد دخالت كشتي‌هاي صيد صنعتي كه اقدام به صيد با روش ترال مي‌نمايند از ساير گزينه‌ها پررنگتر باشد. سرپرست اداره‌كل دامپزشكي هرمزگان دراين‌باره مي‌گويد:هرچند مسئوليت بررسي اين موضوع به‌طور مستقيم برعهده دامپزشكي نيست،اماگروههاي اعزام شده ازسوي دامپزشكي به‌شهرستان جاسك براساس مصاحبه‌هايي كه باافرادبومي انجام داده‌اند واظهارات نيروهاي انتظامي منطقه مبني بر مشاهده كشتي‌هاي صيدصنعتي درمنطقه مرگ دلفينها براثر گرفتارشدن درتور اين كشتي‌ها را بيشتر محتمل مي‌داند. "رضا وحداني" هشدار داد: بايد تا زماني كه نتيجه قطعي بدست نيامده از نسبت دادن اين مرگ وميرها به‌آلودگي دقت بيشتري شود،چراكه اين امر مي‌تواند بر صادرات آبزيان ايران به كشورهاي خارجي تاثير منفي بگذارد. وي ادامه‌داد: ازديگر مواردي كه بايد دراين‌باره موردتوجه‌قرارگيرد تاثير احتمالي تغييرات جوي و طوفانهاي منطقه برآشفتگي بستردريا و درنتيجه تغيير احتمالي تغذيه پستانداران دريايي ازجمله دلفينهاست. دكتر "محمدصديق مرتضوي"، رييس پژوهشكده اكولوژي خليج فارس نيز درباره اقدامات مجموعه تحت مديريت خود درقبال اين حادثه مي‌گويد:پژوهشكده تحقيقات علمي خود را دراين‌باره آغاز كرده، اما جمع‌بندي اين نتايج و تحقيقات ممكن است حدود ‪ ۲ماه به طول بينجامد. هرچند مرتضوي نيز براساس شواهداوليه كشتي‌هاي صيدصنعتي را به‌عنوان مظنون اصلي اين فاجعه زيست محيطي معرفي مي‌كند، اما "موسي بديعي"، مدير كل شيلات هرمزگان چندي پيش دريك نشست رسانه‌اي هرگونه حضور كشتي‌هاي صنعتي در آبهاي استان هرمزگان را قويا رد كرد وبدين ترتيب با اظهارنظر خود بر پيچيدگي‌هاي اين رويداد افزود. When 152 dolphins were washed up on Iran's southern coast mass suicide was blamed. Then suspicion was shifted to fishermen, who were said to have beaten the dolphins with grappling irons after they became entangled in fishing nets. But now a more familiar target has been accused: the US military and its hi-tech hardware and spying equipment. Rejecting suggestions that his employees may have committed a mass cull, the head of Iran's state-run fisheries organisation, Sha'aban-Ali Nezami, has alleged that the dolphins were victims of experimental US surveillance techniques. He has also said they could have been killed by electro-magnetic waves from military vessels in the Gulf and Oman Sea, where the US and British navies conduct regular patrols. Some 73 dolphins were found washed up on the beach near the southern port of Jask last week. A month earlier 79 striped dolphins were discovered in the same area, which is rich in tuna and a site of industrial-scale fishing. Distressing pictures of rows of dead dolphins have appeared in the Iranian media, alongside reports that they had "committed suicide". However, Mr Nezami blamed more sinister factors, telling Iranian journalists: "As these dolphins are not among the species normally found in the surrounding Persian Gulf and Oman Sea, probably the Americans - for tracking purposes - have brought them to carry out laboratory works in the Gulf region. This group of dolphins have not been able to tolerate the tests. The likely reason for these deaths is water pollution, the spreading of electro-magnetic waves by military ships or a kind of virus disease." The explanation was dismissed by environmental experts after tissue examinations showed no sign of poisoning or pollution. The environmental protection agency found bruising on some corpses, arousing suspicion that the dolphins had suffered violent blows. It has formed an inquiry committee consisting of officials from the oil ministry, the state-run shipping organisation and Tehran University's veterinary medicine faculty. "We are basing our hypothesis on fishing - either nets left at the bottom of the Persian Gulf or the big fishing nets that ships spread to catch different kinds of fish," said Mohammad Baqer Nabavi, the agency's deputy head responsible for marine biology. "We are determined to establish the precise cause, not to apportion blame or find the guilty but to prevent such incidents from recurring." That you said we were to gain.. .
TEHRAN, Jan. 26 (Mehr News Agency) -- Giant oil tankers plying the Persian Gulf waters, offshore and onshore oil and natural gas fields as well as the related industries in the region are all posing serious threats to the marine life in this world's major waterway. 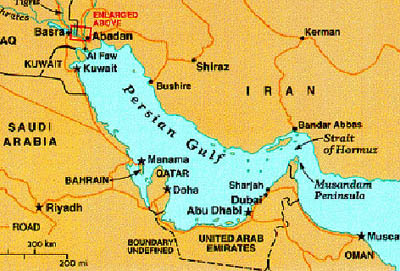 The Persian Gulf, located in the Southwest Asian region, is an extension of the Gulf of Oman located between Iran (Persia) and the Arabian Peninsula. Date: Monday, 29 October 2007, 7:31 p.m. In September, 79 striped dolphins were found washed up near Jask port in southern Iran, and last week another 73 were found dead in the same area. Pictures of rows of the corpses have been widely featured in Iranian newspapers, which said the dolphins had "committed suicide" -- behaviour the animals have occasionally exhibited in the wild. German largest private television, RTL, during its principal evening news 18:30 CET, has shown in great detail why the whales beach themselves. RTL, which covers the whole of Europe, explained that the whales are struck, while in deep dive, by the US Navy sonar waves that makes them (because of its unbearable power) surface in a hurry...much too fast. This liberates compressed nitrogen in their tissue which expands, destroying their brain. It is the same process which divers face if they do not surface slowly allowing gradual adjustment to surface pressure. Sonar is an acronym for "Sound Navigation and Ranging." It is a tool that uses underwater acoustics to determine water depth, the location of mines, and the presence of submarines. It serves as the Navy's front line of defense from underwater attack, and is the only reliable way to identify, track, and target submarines. There are two major classes of sonar: passive and active. Passive sonar is a listening device that uses hydrophones (underwater microphones) that receive, amplify, and process underwater sounds. It is primarily used to detect the presence of submarines. Determination of the type of submarine can be made by matching the frequency of sound detected with the known frequencies of various submarine engine plant sounds and the unique sounds emitted by the different types of propellers in water (cavitation). The advantage of passive sonar is that it places no sound in the water, and thus does not reveal the location of the listening vessel. Passive sonar can indicate the presence, character, and movement of submarines, but it is ineffective at detecting modern, quiet submarines running submerged on batteries, as well as submarines that are motionless (lying in wait) or running at very low speeds. Active sonar is needed for precise location, classification, and rapid targeting. Active sonar emits pulses of sound that travel through the water, reflect off objects, and return as an echo to an underwater acoustic receiver. It uses an underwater speaker to generate sound waves. The sound waves travel until they strike an object and are reflected in various directions. Some of the reflected waves return to the receiver, where they are converted back into electric signals, amplified and displayed. A careful interpretation of the sound can provide the direction and distance of the object, as well as its size and speed. This is accomplished through "echo ranging," which measures the time it takes for a sound wave to travel from the transducer, reflect off the object, and return to the receiver. Active sonar is critical for locating and tracking submarines. It is used sparingly, however, because it also allows an enemy submarine to pinpoint the position of the ship emitting the sound. To put Navy active sonar use in perspective, it is important to note that, of the U.S. Navy's approximately 280 surface ships, only about 58% are equipped with mid-frequency active sonar. About half of these ships are underway at any given time, and for each ship, active sonar is turned on only a small percentage of the time (during certain types of training and maintenance activities). Different types of active sonars operate at different frequencies, according to their purpose. High Frequency: High frequency sonar (>10 kHz) is primarily used for determining water depth (fathometers), hunting mines, and guiding torpedoes. At higher frequencies, the sound energy is greatly attenuated (weakened due to scattering and absorption) as it travels through the water. This results in shorter ranges, typically less than five nautical miles. Mid Frequency: Mid frequency sonar, which includes the AN/SQS-53 system, has been in use since World War II, and is the primary tool for identifying and prosecuting submarines. Mid frequency sonar (1 kHz - 10 kHz) suffers moderate attenuation and has typical ranges of 1-10 nautical miles. Low Frequency: Low frequency sonar (< 1 kHz) produces sound that suffers less attenuation as it travels through the water, providing greater range than other sonars. Achieving ranges up to 100 nautical miles, low frequency sonars are primarily used for long-range search and surveillance of submarines. Surveillance Towed Array Sensor System Low Frequency Active (SURTASS LFA) is the U.S. Navy's low-frequency sonar system. Everybody already knows that the new, high-powered US Navy�s Low-Frequency Active Sonar (LFAS) system, which has been tested in secret for years, is to be soon, officially, put in to the operation. It�s noise, which is billions of times more intense than that known to disturb whale migration and communication, has been and is efficiently killing whales and dolphins all around the world. Although the brain and tissue fissures, lesions and ruptures as well as mass starvation consistently found in these marine mammal corpses closely resemble the symptoms of sonar exposure described by the Marine Mammal Commission, when in 1997 they predicted that "...lung and tissue hemorrhage and trauma in marine mammals (and fish) as well as cavity explosion and hearing loss causing subsequent starvation was likely to occur if LFAS was employed worldwide as proposed. ", public at large has had the first opportunity to know the reason why this mammals, being air-breathers as we are, have been beaching themselves from the December 6, 2000 intervention of Jean-Michel Cousteau, founder and president of Ocean Futures Society, Robert F. Kennedy Jr., attorney with the Natural Resources Defense Council, and Joel R. Reynolds, attorney and director of NRDC's marine mammal protection project. On August 14, 2001all mayor mainstream media, reported that hundreds of sharks have been sighted off central Florida's west coast. Terri Behling, a spokeswoman for Mote Marine Laboratory in Sarasota, said that it is not unusual for sharks to swim up and down the gulf coastline, following tarpon. But a congregation of different species is unusual, she said. Until the August 23, eight surfers and swimmers were attacked by sharks in that area. In Croatia, during the Spring and early Summer 2001 two dolphins, one whale and one white, 6 meters long shark were found floating around. In the same period, two U.S. nuclear subs have visited Dubrovnik, medieval city-fortress on the shore at the southern end of Croatian part of Adriatic sea, and, at the beginning of the August, one naval task force, consisting of aircraft carrier USS KEARSARAGE, and support ships EMORY S. LAND, CARTER HALL, PONCE and Mc FAUL, together with one unknown nuclear sub were in visit to the largest Croatian port in the northern end of Adriatic, the city of Rijeka. Dolphin (on the adjacent image) was found during the last visit, 60 km from Rijeka and whale further 50 km to the south. Adriatic sea, which makes northeastern pocket of the Mediterranean sea, is basically 1000 km long and 150 km wide bay, so the whales and large sharks, which follow the ships eating the garbage their crews throw overboard, rarely wade up its waters. This number of death whales, dolphin and sharks has no recorded precedent. Fish, being water breathers, do not count. They simply pile up on the bottoms of the seas and oceans or are eaten after the ships go away. Whales remain visible simply because they are too bulky to be eaten all at once. Now a part of the mural on the Denver Airport, which depictures whales jumping out of the water, makes sense. Iranians probably know all this which means that they know that U.S. subs in Persian Gulf have switched to battle mode and now use their active sonar (that fourth one). As if attack were imminent. WASHINGTON, DC, November 12, 2008 (ENS) - The U.S. Supreme Court today lifted restrictions on the Navy's use of sonar off the coast of California, handing a defeat to environmentalists who say the limits are needed to protect whales and dolphins. The court, in a 6-3 decision, ruled that a lower court judge had wrongly allowed the environmental impacts of the training exercises to trump U.S. national security interests. Earthjustice was founded as the Sierra Club Legal Defense Fund in 1971. Since then, it has become the leading nonprofit environmental law firm in the country. Jan 29: Watch more of Joel Reynolds from the Natural Resources Defense Council and Vice Admiral Samuel Locklear, Commander, U.S. Third Fleet, discuss the Navy's use of sonar and the possible harm it can cause to marine mammals. Numerous mass stranding events and whale deaths across the globe have been linked to military sonar use. October 1989: At least 20 whales of three species strand during naval exercises near the Canary Islands. December 1991: Two Cuvier's beaked whales strand during naval exercises near the Canary Islands. May 1996: Twelve Cuvier's beaked whales strand on the west coast of Greece as NATO ships sweep the area with low- and mid-frequency active sonar. October 1999: Four beaked whales strand in the U.S. Virgin Islands during Navy maneuvers offshore. May 2000: A beaked whale strands in Vieques as naval exercises are about to begin offshore. May 2000: Three beaked whales strand on the beaches of Madeira during NATO naval exercises near shore. April 2002: A beaked whale and a humpback whale strand near Vieques during an offshore battle group training exercise. September 2002: At least 14 beaked whales from three different species strand in the Canary Islands during an anti-submarine warfare exercise in the area. Four additional beaked whales strand over the next several days. May 2003: As many as 11 harbor porpoises beach along the shores of the Haro Strait, Washington State, as the USS Shoup tests its mid-frequency sonar system. June 2004: As many as six beaked whales strand during a Navy sonar training exercise off Alaska. July 2004: Approximately 200 melon-headed whales crowd into the shallow waters of Hanalei Bay in Hawaii as a large Navy sonar exercise takes place nearby. Rescuers succeed in directing all but one of the whales back out to sea. July 2004: Four beaked whales strand during naval exercises near the Canary Islands. January 2005: At least 34 whales of three species strand along the Outer Banks of North Carolina as Navy sonar training goes on offshore. Of the 13 beaked whales that stranded in the Bahamas in March 2000 after exposure to active sonar, seven died, including this one. and industrial ocean noise on marine life. Scientists have proven that military sonar can injure and even kill whales. To protect marine life from the lethal effects of sonar, NRDC is working nationally and internationally to establish strict regulations on sonar use so that whales and other marine mammals don't have to die for practice. Posted: Mon Nov 24, 2008 12:00 pm Post subject: suicidal dolphins? A group of 73 dolphins of the persian gulf beached in Jask, Iran. a few that where still alive were dragged into the waters by the locals but only for them to come back to the shore. The cause of such a catastrophe is still under investigation. Investigators have not found any signs of poisening/disease or fishnet wounds so far. They are now looking into possible nuerological defects caused by intense military sonar activity in the persian gulf. Petition 66: Global International Change Request 1- Tell Us Why 6 Million Dolphins Have Been Killed and Massacred In The Past 30 Years? And Why No Global Water Pollution Control Law? We are outraged by the annual brutal slaughter of dolphins and whales that takes place in Japan and in the Faroe Islands Denmark. The images of bloody red water clearly show the world that Japan and Faroe Islands Denmark have little respect for the state of the world�s oceans and Dolphin rights to exist. 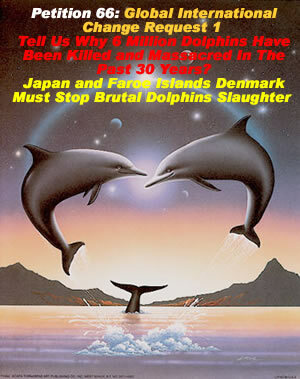 We demand that Japan and Denmark permanently and immediately renounce and stop dolphins slaughter. Please watch documentary video clips. How many dolphins do you think it is reasonable to kill in order to catch the Tuna fish? If we knew the realities behind our choices, would take a step back and reconsider � Due to lack of comprehensive Unified International Mother Earth clean water act (ocean, sea, lakes, rivers, streams, wetlands, and ponds), we are asking our elected representative and UN to co-sponsor an important 360 degree clean water protection bill to stop over fishing and pollution, to clean Persian Gulf from oil pollution, to regulate harmful Navy Sonar systems, to establish international monitoring programs with the stringent "zero discharge" of pollutants into the mother earth�s waters, and integrated international community enforcement of water quality standards agreement. We have learned from the Epic of Kings masterpiece by Ferdowsi (935-1020) the world famous great Persian poet: "Crush not even the tiny ant that beareth a grain of corn, for she hath life, and sweet life is a boon." Now as a first step for the Real Global Change please sign, support, and distribute this petition to increase public awareness and global actions to promote Dolphin Rights to the same level of Human Rights. Due to the complexity of this major global problem domain, our active participation, and global dialogue is required and if you have a new innovating solution, brilliant idea, actions or recommendations please consider to share it with public in the comments section of this petition. گروهی از ایرانیان دوستدار محیط زیست از سراسر جهان، در نامه ای به دبیر کل سازمان ملل، رهبران انتخابی جهان، نمایندگان و فعالان حقوق بشر، نسبت به قتل عام شش میلیون دلفین در سی سال گذشته و نبود قانونی برای کنترل آلودگی آب های بین المللی اعتراض کردند و در اعتراض نامه ای که بر روی پایگاه اینترنتی petitiononline گذاشته اند ضمن ابراز خشم خود از قتل عام بی رحمانه و سالیانه دلفین ها و نهنگ ها در ژاپن و جزایر فاروی دانمارک ، با استناد به تصاویر و فیلم های منتشر شده از قتل عام دلفین و نهنگ ها، تاکید نموده اند � تصاویر آب های خونین، آشکارا به جهانیان نشان می دهد که ژاپن و جزایر فاروی دانمارک کوچک ترین احترامی برای اقیانوس های جهان و حق زندگی دلفین ها ندارند. ما خواستار آنیم که ژاپن و دانمارک بلافاصله و برای همیشه قتل عام دلفین ها را متوقف کنند�. دوستداران محیط زیست می توانند [url]با امضای این اعتراض نامه[/url] به این حرکت جهانی برای نجات جان این زیستمندان زیبا بپیوندند. گفتنی است، در فرهنگ ایران دلفین بستگی نزدیک با آیین مهر دارد چنان که در بسیاری از آثار برجا مانده از این آیین ، مهر در دوران کودکی و در کنار مادرش (ناهید) یا به تنهایی سوار بر دلفین دیده می شود. در نقش نوعی از قالی های زیبای ایرانی با نام � ماهی در هم � یا � هراتی � نیز می توان ردی از دلفین و پیوند آن با دیگر نمادهای آیین مهر همچون گل نیلوفر را یافت. دلفین ها از پستانداران دریایی هستند که حدود 35 گونه از آن ها در جهان شناخته شده است. آلوده نمودن آب اقیانوس ها، دریاها و رودخانه ها توسط انسان ها و به ویژه با حشره کش ها ، فلزات سنگین ، پلاستیک و سایر آلوده‌کننده های صنعتی و کشاورزی ، جراحت در اثر برخورد با قایق ها ، کشتی ها و تورهای ماهی گیری و صیادی به ویژه هنگام صید ماهی تن از مهم ترین دلایل مرگ دلفین ها به شمار می روند . از آن جا که در بخشی از شرق اقیانوس آرام تن ماهیان و دلفین ها با هم شنا می کنند،صیادان برای صید تن ها از تورهای گوش گیر استفاده می کنند که در نتیجه با این تورها دلفین ها هم کشته می شوند. اما دردناک تر از همه این که در برخی از مناطق جهان همچون ژاپن و جزایر فاروی دانمارک دلفین ها به عنوان منبع غذایی انسان، با نیزه های مخصوص به شیوه ای غیر انسانی و وحشیانه کشتار می شوند. به طور کلی بخشی از صید جهانی دلفین ها در هر سال توسط ژاپنی ها صورت می گیرد. علاوه بر صید ، ژاپنی ها به هر بهانه ای مثل نجات ماهی ها و در هر فرصتی مثل به گل نشستن وال ها آنها را می کشند و بر اساس بانک اطلاعات اتحادیه جهانی حفاظت از حیات وحش (IUCN)، شکار زیاد دلفین‌ها در ژاپن باعث کاهش تعداد آن ها در اقیانوس آرام شده است. برپایه آمار ، در طول 30 سال گذشته حدود شش میلیون دلفین به روش های گوناگون کشته شده اند.